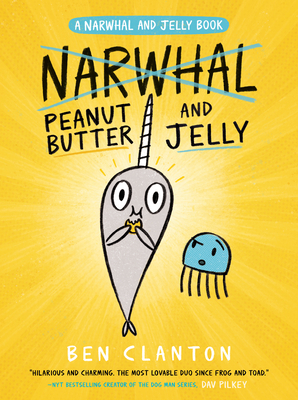 Narwhal's obsession with his new favorite food leads him into hijinks and hilarity in the third book of this all-star early graphic novel series! Narwhal and Jelly are back and Narwhal has a new obsession . . . peanut butter! He's so obsessed he even wants to change his name to . . . that's right . . . Peanut Butter! Ever-sensible Jelly isn't so sure that's the best idea, but is all for Narwhal trying new things (instead of just eating waffles all the time, no matter how delicious waffles are). In this third book, Narwhal and Jelly star in three new stories about trying new things, favorite foods and accepting who we are. Always funny and never didactic, this underwater duo charms again through their powerful combination of positive thinking, imagination and joyfulness. BEN CLANTON is an author and illustrator whose picture books include It Came in the Mail, Something Extraordinary, Rex Wrecks It!, Mo's Mustache and Vote for Me! He is the illustrator of the Jasper John Dooley series by Caroline Adderson and the illustrator of Max Has a Fish by Wiley Blevins. He lives with his wife and son in Tacoma, Washington.